Gov. Mark Dayton and the DFL-controlled House and Senate largely agree on the parameters of the budget for the next biennium. The plans put forward by each of the three propose spending in the neighborhood of $38 billion over the next two years. Gov. Mark Dayton and the DFL-controlled House and Senate largely agree on the parameters of the budget for the next biennium. The plans put forward by each of the three propose spending in the neighborhood of $38 billion over the next two years. DFL leaders are also in accord on the need to increase income taxes on the state’s wealthiest residents. And all three devote a significant chunk of the increased funding to education. But when you dig into the details of those proposals, they still diverge in substantial ways. Reconciling those differences will be the main order of business at the Capitol over the next month as legislators seek to pass their budget bills by the end of April. The timing of the House and Senate targets release, just days before the Easter/Passover break, will give lawmakers a chance to return to their districts and gauge public sentiment. When the Legislature reconvenes, the process is expected to move quickly. House members set their target at $37.8 billion — or roughly $100 million less than Dayton’s budget. But that comes with a huge asterisk: That figure doesn’t include more than $850 million owed to school districts, which the House plans to pay back in full during the next biennium. When that’s added to the budget, the House anticipates pending roughly $750 million more than the governor. DFLers released few details about how they’ll generate that revenue. 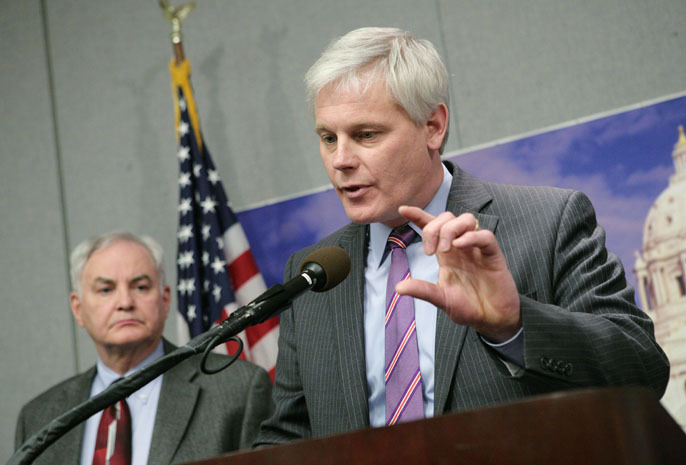 But House Speaker Paul Thissen indicated that a fourth-tier income tax rate on upper-income earners will be part of the tax package. And on top of that, they’ve proposed a temporary surcharge on incomes over $500,000 that will blink off after two years, or once the K-12 aid shift is repaid in its entirety. Rep. Mary Liz Holberg, R-Lakeville, the ranking minority members of the Ways and Means Committee, also pointed out that the full extent of proposed new revenue streams won’t be known until bills are fully assembled. “Within these net targets, there can be all kinds of fee increases and additional spending,” Holberg noted. The Senate — which released its targets Wednesday morning as this issue of Capitol Report was going to press — anticipates spending $38.2 billion over the next biennium, or roughly $300 million more than the governor’s revised budget. That includes $2 billion in new revenues above current-law projections for the next two-year budget cycle. Bakk said he expects three components to definitely be included in the revenue mix: higher income taxes on wealthy individuals, increased cigarette taxes, and an expansion of the sales tax to include items sold online. The biggest difference between the three proposed DFL budgets is how they deal with paying back the school shift. House members have signaled from the outset that repaying that money is at the top of their agenda. By contrast, the Senate and Dayton put no money toward paying the schools shift back in the next biennium. Dayton has been dismissive of the need to deal with the issue immediately. While school districts obviously want the money that they’ve been promised, they’re not necessarily clamoring for it to be paid back immediately. Scott Croonquist, executive director of the Association of Metropolitan School Districts, says that the group’s top priority is increased funding for school districts going forward. “While it’s important that [the shift] be paid back eventually, it’s not as high a priority for us to accelerate that repayment,” Croonquist said. Croonquist also points out that the cash crunch for school districts has eased considerably given that nearly two thirds of the original $2.4 billion shift has already been paid back. “Right now the number of districts that are needing to borrow has dropped dramatically,” he said. Another significant difference could emerge over sales tax reforms. Dayton initially proposed dramatically broadening and lowering the sales tax, including its application to a whole range of business-to-business services. But that sparked an outcry from business interests and Dayton backed off that proposal after taking a drubbing from Republicans and even some of his fellow Democrats. Otherwise the three budgets differ at the margins. The House and Senate both propose spending $15.7 billion on K-12 education, including more than $100 million in additional money to provide funding for all-day kindergarten statewide. That’s about $200 million more than Dayton’s proposes spending on K-12 education. Rep. Paul Marquart, DFL-Dilworth, chair of the Education Finance Committee, extolled the focus on early childhood learning. “Study after study after study shows that when you invest early, you raise the graduation rates, you raise performance rates, you lower the achievement gap,” Marquart said. In higher education, by contrast, Dayton’s budget proposes spending $2.8 billion. That would provide $80 million in added funding each for the University of Minnesota, the Minnesota State Colleges and Universities system and the state’s tuition assistance program. That’s about $100 million more than the House and Senate propose. In health and human services funding, the second-largest and fastest-growing sector of the budget, both the House and Senate propose deeper cuts than Dayton. Both legislative chambers want to cut $150 million from the spending levels anticipated under current law. By contrast, Dayton is seeking an increase in health and human services spending of just over $200 million. The Senate wants to spend $3.2 billion on tax aids and credits — roughly $300 million more than either the House or the governor. That would allow the Senate to restore the homestead credit and significantly bolster aid to cities and counties.